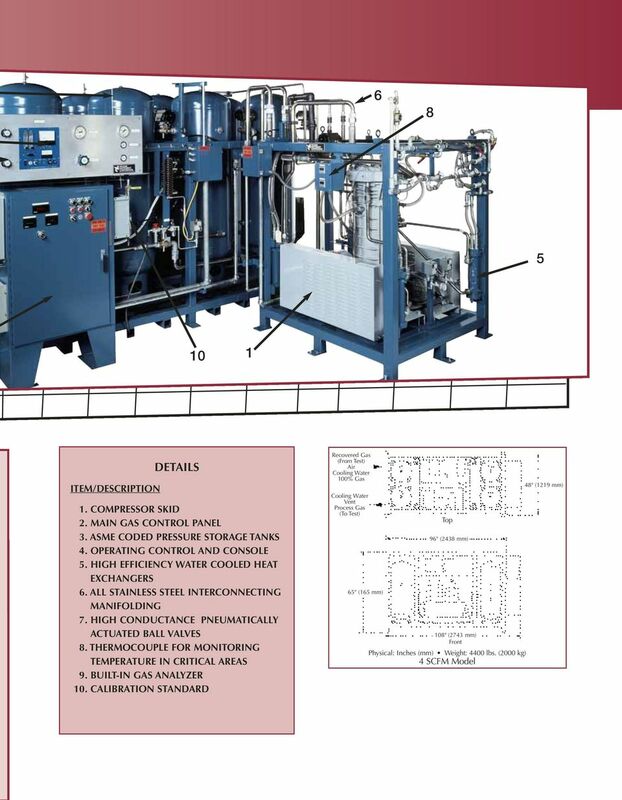 Download "GAS HANDLING SYSTEMS VACUUM INSTRUMENT CORPORATION"
3 Complete operation instructions in plain English and other languages VACUUM DECAY DIFF. E SELECT B UP F DOWN Smart Charge shown with Turbo Test MD-490S. Our interactive display provides information on testing options... HEL. CHRGE 220 PSIG A EXIT E SAVE Current system configuration... HELIUM PRESS. DECAY E SELECT B UP F DOWN And operation sequence... All of which makes the Smart Charge friendly! 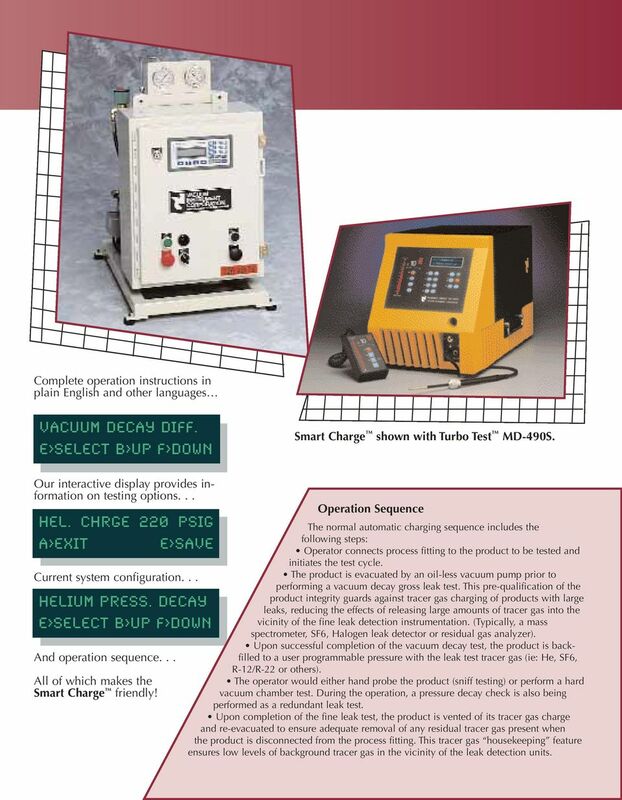 Operation Sequence The normal automatic charging sequence includes the following steps: Operator connects process fitting to the product to be tested and initiates the test cycle. The product is evacuated by an oil-less vacuum pump prior to performing a vacuum decay gross leak test. 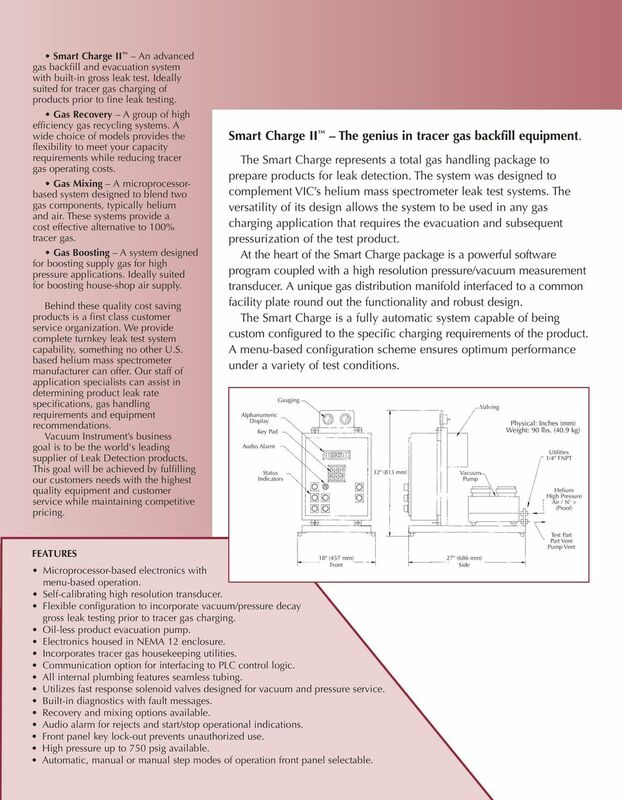 This pre-qualification of the product integrity guards against tracer gas charging of products with large leaks, reducing the effects of releasing large amounts of tracer gas into the vicinity of the fine leak detection instrumentation. (Typically, a mass spectrometer, SF6, Halogen leak detector or residual gas analyzer). Upon successful completion of the vacuum decay test, the product is backfilled to a user programmable pressure with the leak test tracer gas (ie: He, SF6, R-12/R-22 or others). The operator would either hand probe the product (sniff testing) or perform a hard vacuum chamber test. During the operation, a pressure decay check is also being performed as a redundant leak test. Upon completion of the fine leak test, the product is vented of its tracer gas charge and re-evacuated to ensure adequate removal of any residual tracer gas present when the product is disconnected from the process fitting. This tracer gas housekeeping feature ensures low levels of background tracer gas in the vicinity of the leak detection units. 4 3 RECYCLING, a term whose time is NOW! As we enter the 21st century, conservation of our natural resources has become a paramount issue. 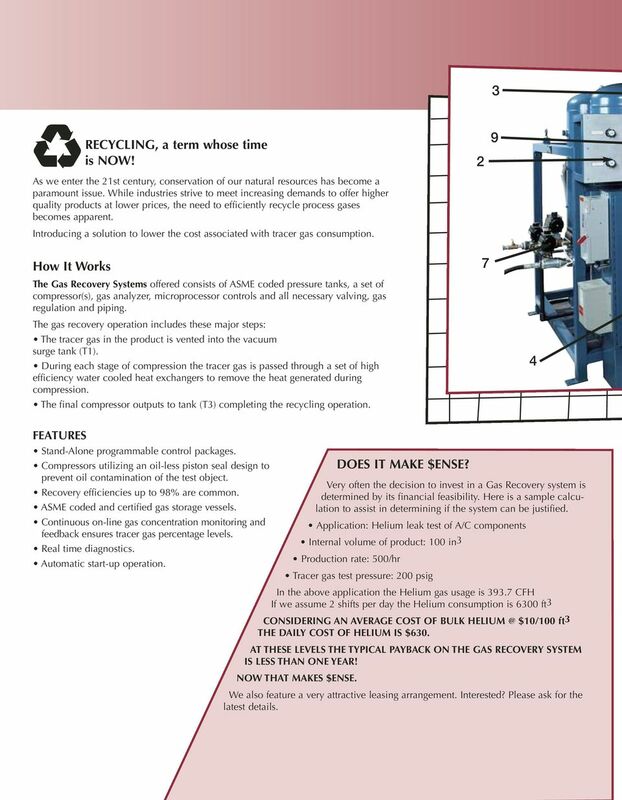 While industries strive to meet increasing demands to offer higher quality products at lower prices, the need to efficiently recycle process gases becomes apparent. Introducing a solution to lower the cost associated with tracer gas consumption. 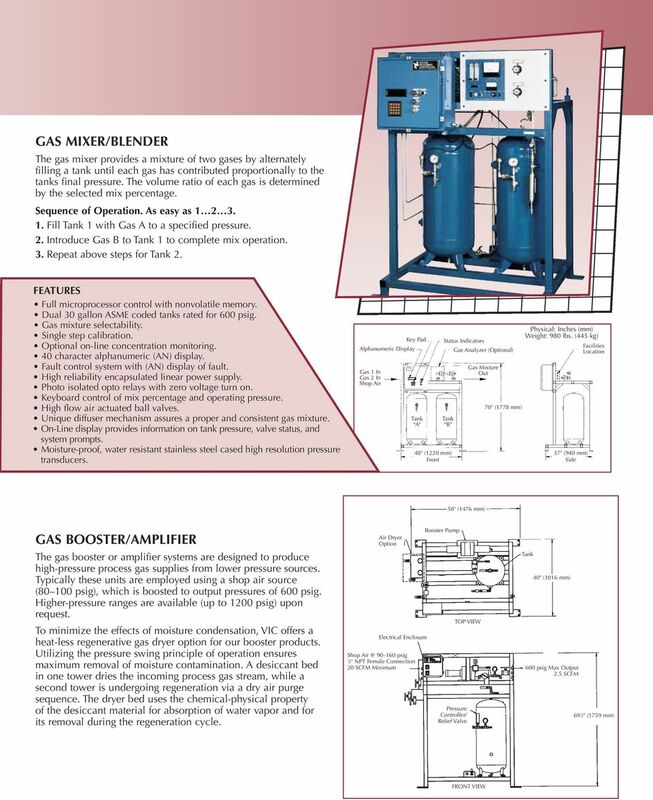 2 9 How It Works The Gas Recovery Systems offered consists of ASME coded pressure tanks, a set of compressor(s), gas analyzer, microprocessor controls and all necessary valving, gas regulation and piping. 7 The gas recovery operation includes these major steps: The tracer gas in the product is vented into the vacuum surge tank (T1). During each stage of compression the tracer gas is passed through a set of high efficiency water cooled heat exchangers to remove the heat generated during compression. The final compressor outputs to tank (T3) completing the recycling operation. 4 FEATURES Stand-Alone programmable control packages. Compressors utilizing an oil-less piston seal design to prevent oil contamination of the test object. Recovery efficiencies up to 98% are common. ASME coded and certified gas storage vessels. Continuous on-line gas concentration monitoring and feedback ensures tracer gas percentage levels. Real time diagnostics. Automatic start-up operation. DOES IT MAKE $ENSE? 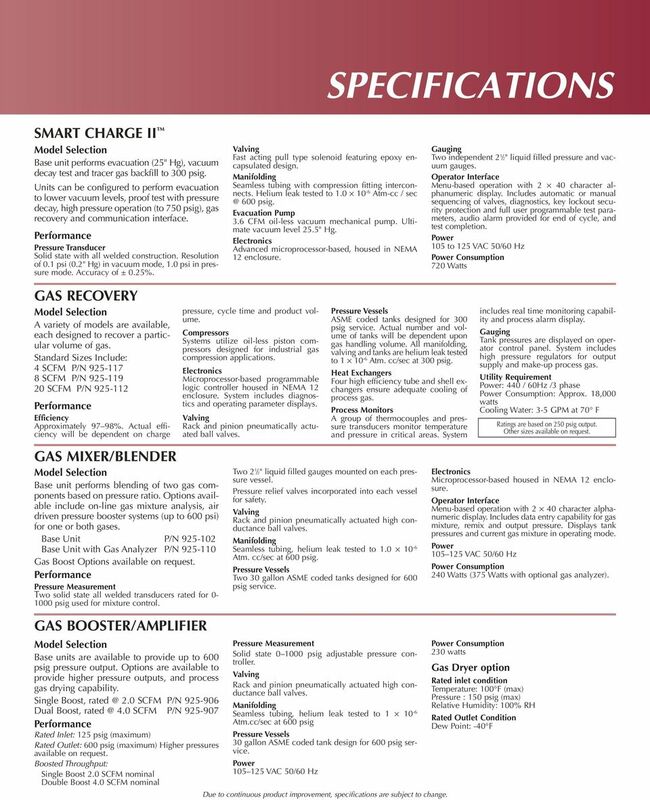 Very often the decision to invest in a Gas Recovery system is determined by its financial feasibility. Here is a sample calculation to assist in determining if the system can be justified. Application: Helium leak test of A/C components Internal volume of product: 100 in3 Production rate: 500/hr Tracer gas test pressure: 200 psig In the above application the Helium gas usage is CFH If we assume 2 shifts per day the Helium consumption is 6300 ft3 CONSIDERING AN AVERAGE COST OF BULK $10/100 ft3 THE DAILY COST OF HELIUM IS $630. AT THESE LEVELS THE TYPICAL PAYBACK ON THE GAS RECOVERY SYSTEM IS LESS THAN ONE YEAR! NOW THAT MAKES $ENSE. We also feature a very attractive leasing arrangement. Interested? Please ask for the latest details. CPX/HT Series. REFRIGERATED AND HIGH TEMPERATURE DRYER 12 to 2400 CFM. High-performance products. Designed for you! PREMIUM HIGH-PRESSURE DRYING HIGH QUALITY COMPRESSED AIR FROM BEKO The quality of your compressed air. RELIABLE The highest level of operational reliability is guaranteed with every product that BEKO manufactures. Engineered Adsorption Solutions Partnership Success SOLUTIONS BUILT FOR THE FUTURE. Adsorption Air Dryers. OUR PRODUCTS TRH-TRS-TRM-TRV. LIQUID RING VACUUM PUMPS AND COMPRESSORS Capacity up to 2100 ACFM Vacuum to 29 Hg. Our Other Products. We re a dedicated team of compressed air specialists, passionate about good design, energy efficiency and reliability.